“A typhoon is coming!” The hotel staff delivered this message with a smile and seemingly without real concern. “It’s making a stop here on its way to Japan”, they explained. Coming from a part of the world where typhoons are as exotic as using a coconut as a drinking vessel, I really didn’t know how to accommodate this information into my plans of sightseeing in Taipei. In the end I decided that if they weren’t concerned, neither would I be. 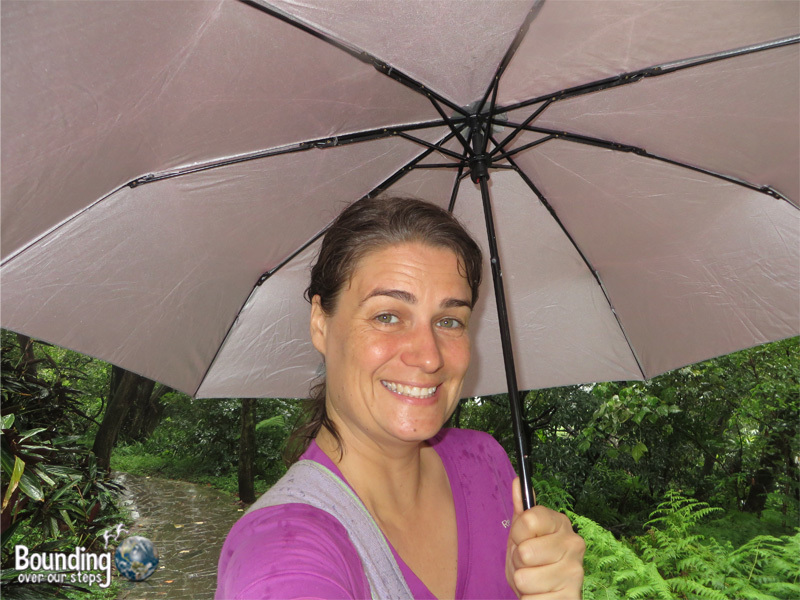 And so, armed with nothing more than an umbrella, I stepped out of the hotel to navigate the streets of Taipei. The strong wind I experienced walking to the metro had definitely not been there the day before. And only a few stops away at Xiangshan stop (end of the red line), it had already begun to rain. With umbrella opened I followed the signs that read “hiking trail” through one of Taipei’s many small parks and up the hill to the left. After passing an ornate building I found the steps again to the left leading up to Elephant Mountain, which promises gorgeous views of Taipei’s famous 101 Tower. But who knows what the view would look like in a typhoon! 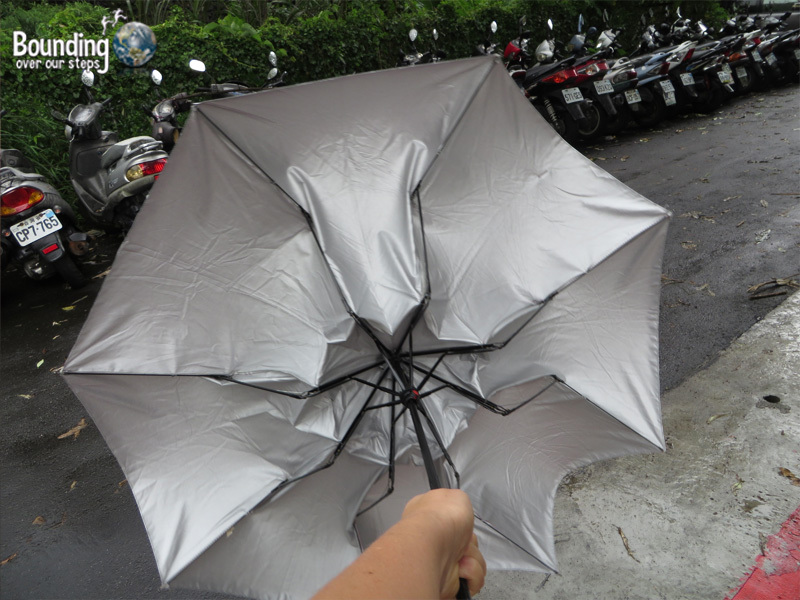 I began to climb the stairs and the wind picked up causing me to have trouble keeping the umbrella above my head. (I have secretly always enjoyed watching people struggle with their umbrella so I felt karma getting the best of me.) The further I climbed the steps seemed to get steeper, the wind became stronger and the steps became decidedly more slippery as it continued to rain. But onward I climbed. One of the best things about hiking in the rain is that you share the trail with relatively few people. The people I did meet along the way were all locals from Taipei, giving me the opportunity to finally practice my very bad Taiwanese versus my very bad Mandarin. 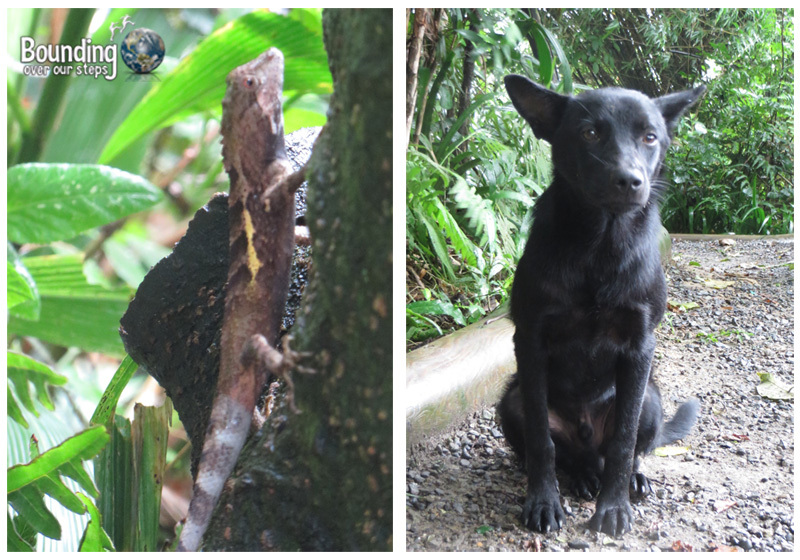 I also met a stray dog who walked with me for awhile before curling up under a tree for a rest. Even in a typhoon the views at the top did not disappoint. 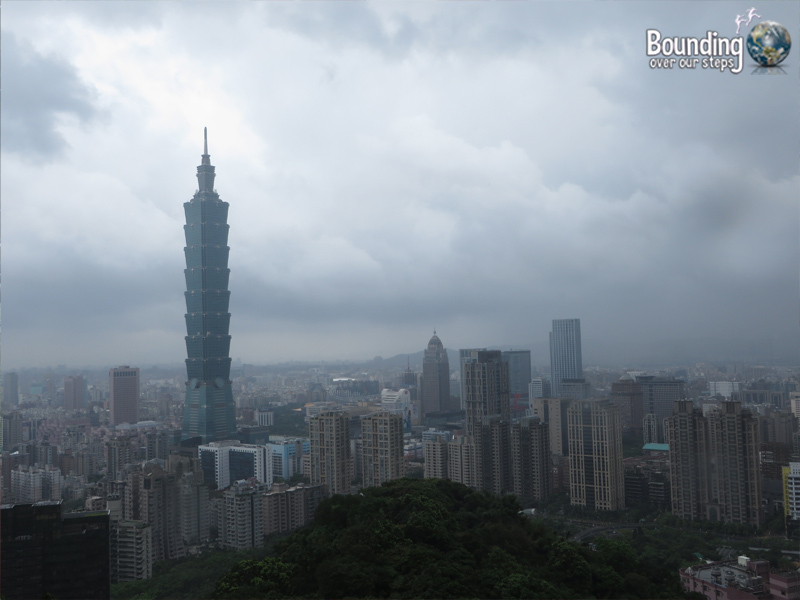 The wooden platform was both empty and extremely slippery but I was able to enjoy the view of one of the tallest buildings in the world, as well as the rest of Taipei’s skyline with swaying trees all around me. At one point, reminding me why I was the only tourist at the outlook, the wind almost knocked me over! 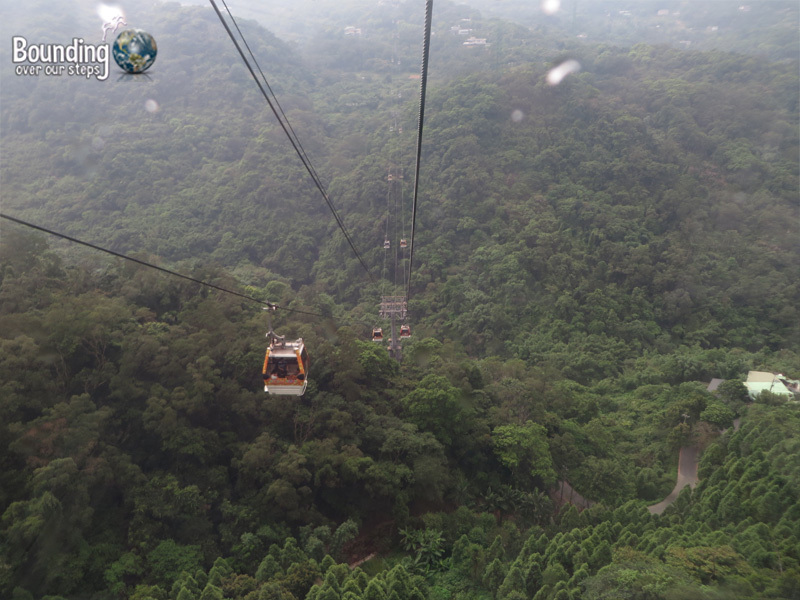 And why should a little rain and wind stop me from taking a gondola ride to the top of Maokong Mountain, also with promises of beautiful views. 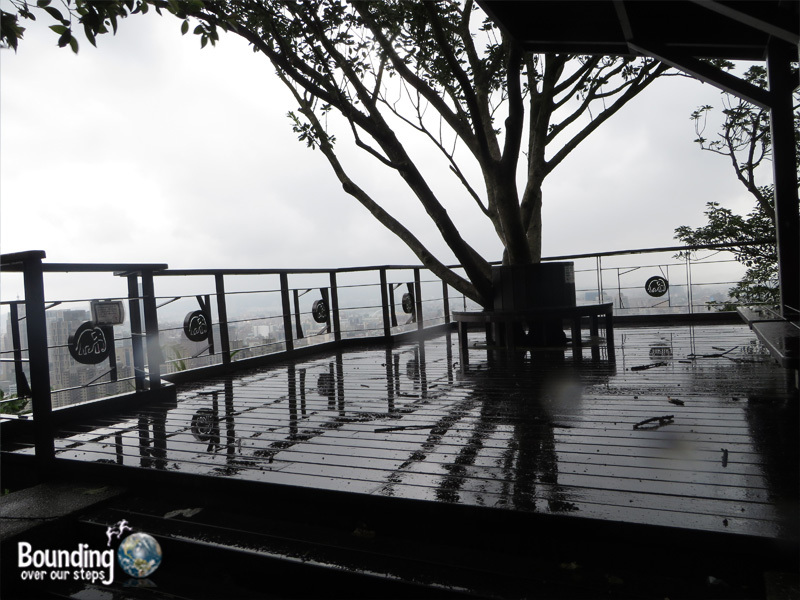 So, the next day still with the visiting typhoon, I set out for the Taipei Zoo station (end of the brown line), took exit 2 and carefully walked the couple of blocks on very slippery pavement, passing the zoo on my left, to the gondola station. 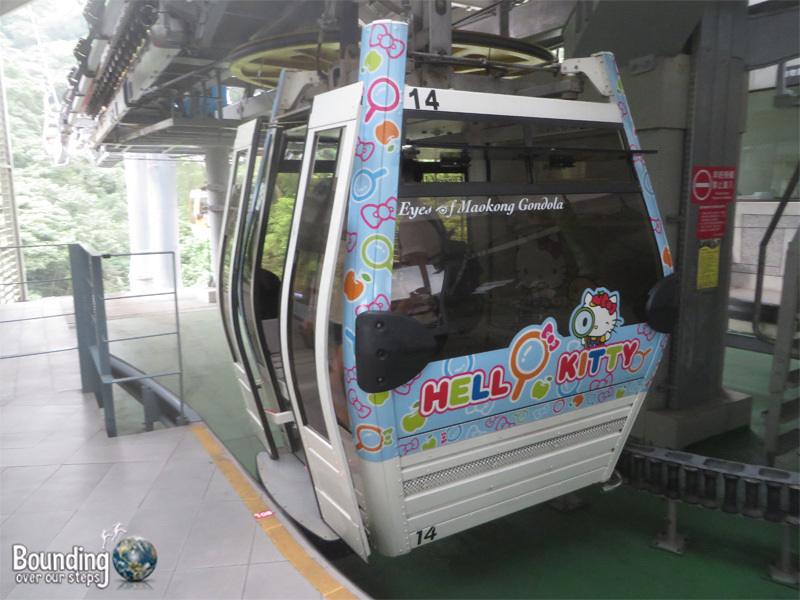 I headed upstairs and got in line for the regular gondola, since it was so much shorter than the glass bottom one. Before I knew it I found myself in my very own gondola heading up to the mountain. 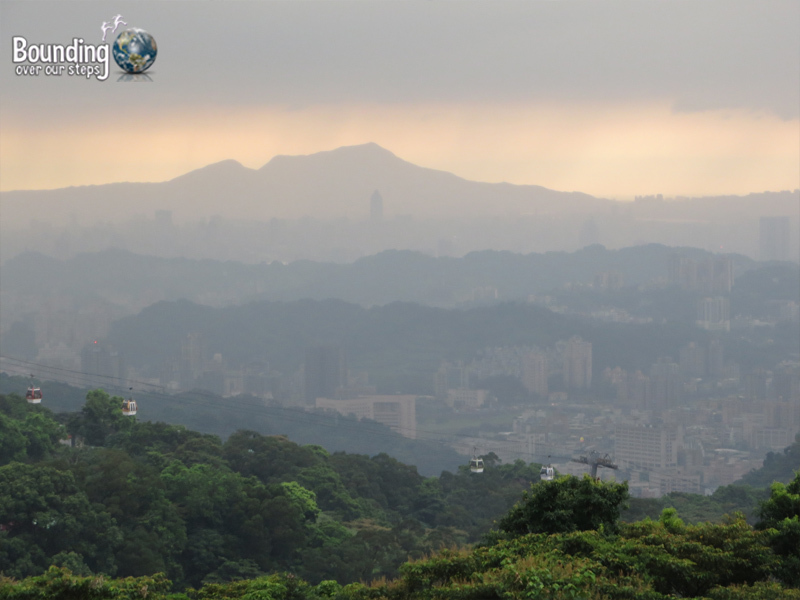 For the next twenty minutes I was surrounded by stunning views of the city, the jungle and even the typhoon, which allowed a streak of bright sunlight to poke through the horizon with dark looming clouds covering the rest of the sky. 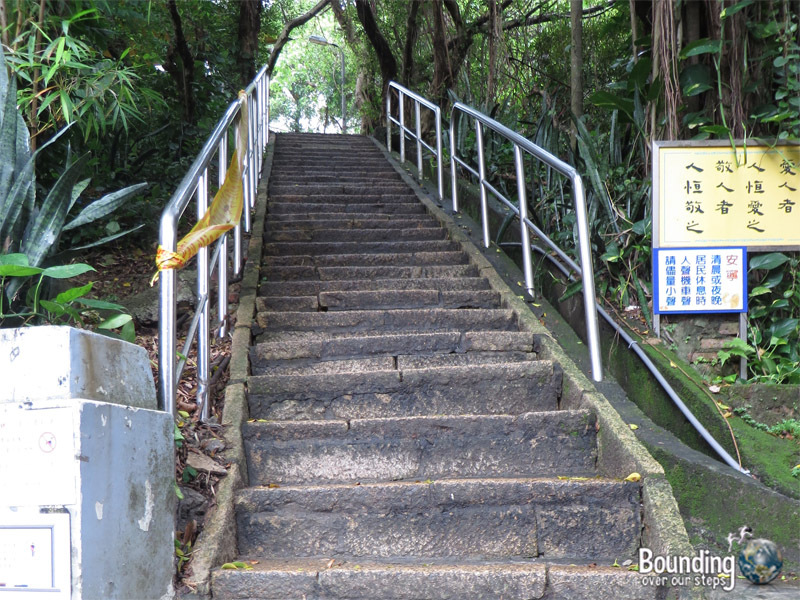 Unlike at Elephant Mountain the top of Maokong Mountain was full of nothing but tourists and vendors. And so I started walking…past the people selling various animal parts, past the ice-cream burrito stands and past the trinket vendors. I came upon several tea houses, a Buddhist temple and beautiful views. It had started to rain and without an umbrella I tried to make a hat out of a huge leaf. After all, it looked so easy when the mahouts in Thailand did it! I am sure that I being talked about to this day in a variety of countries for the ridiculous (and mostly not even functional) head gear I sported. But something told me to walk back to the station and I’m so glad I did. This time I decided to get in line for the glass bottom gondola and only had to wait for a few minutes. But, due to “imminent weather”, I was told I could not have a gondola all to myself as I did on the way up. They had to get as many people off the mountain as possible and every minute counted! So, I found myself sharing the gondola with three Japanese women on vacation and their Taiwanese friend who was showing them around. 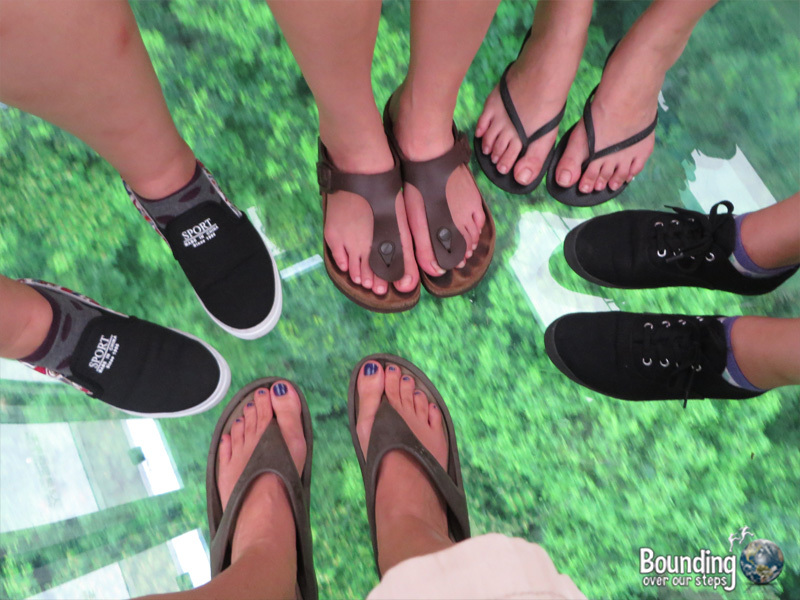 The glass-bottom was novel for my new friends too and so we all delighted in the view, taking pictures of our feet passing over the lush green mountain. The rain poured over the gondola as we introduced ourselves and decided to name our car “ichi ban” (number one in Japanese). Just then, out of nowhere a voice came over the loud speaker, that we hadn’t even known was a part of the gondola, saying something in Mandarin. We all looked to the Taiwanese woman who had a bit of a panicked look on her face. She translated the message into English for us saying that the gondola would be stopped due to thunderstorms and extreme wind. I instinctively grabbed hold of something and wondered how far away we were from the bottom. We all encouraged each other by staying positive, saying things like “We are ichi ban. We can make it!” Still cameras were put away and we watched our gondola slowly slide down the mountain. When we arrived we gave each other a smile and a wave goodbye and couldn’t help but notice that there was no longer a line for the gondola. It had been shut down and we were one of the last cars to come down the mountain. What an adventure! Where have you been on vacation in inclement weather? Now that is just a NEAT story, Ligeia! You’ll have those memories forever! You are one brave women!